The restaurant was our luncheon stop after our segway ride and we had worked up an appetite. Traveling with three other travel writers and our Nova Scotia tourism guide Janette, we were ready for whatever the restaurant operators Jim and Diane Buckle and chef, Jon Geneau, had to offer. Along with a Nova Scotia white wine, I tried out the seafood Chowder and lobster roll, which was excellent! Fresh lobster makes all the difference I am finding. Living in the land locked midwest, I now truly appreciate the taste of fresh catch. The restaurant and nearby Oceanstone Seaside Resort used to be a Buddhist retreat around 1998. “Then the vibe changed in Indian Harbour,” Jim said. A new owner purchased the complex and the Rhubarb Restaurant and lovely Oceanstone resort was born. Chef Geneau said that he has been working in kitchens since 1998 and has been a chef for 3-4 years. “My mother is a home economics teacher and I went to college (culinary classes) part time and decided to make a career out of it. I try to use everything from Nova Scotia,” Chef added. In the downstairs we made the ultimate discovery at the Backdoor Bakeshop where Kate Melvin lured us with her salted caramels. Hands down, this was the best dessert I had while traveling in Nova Scotia and we had some ultimate treats! Kate posed for the photo above showing us her caramels before they had been dipped in chocolate. 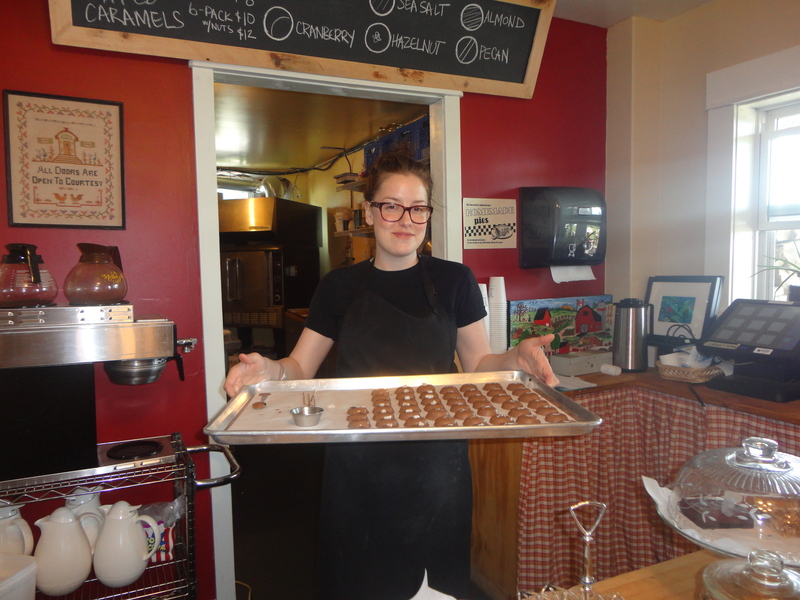 She has been offering a line of handmade chocolates since their Valentine weekend launch. Her creations include; Salted Caramels, Milk & Dark Chocolates with Almond, Hazelnut, Pecan Brittle, Cranberry, Candied Ginger. They can be purchased at rhubarb, individually or as a box of four or six. After gorging ourselves, we took a quick tour of the picturesque Oceanstone Resort that is a keen place for family reunions, weddings or just a getaway. The site offers rustically beautiful accommodations along with the restaurant and bakery you have all you need for a perfect stay. For more information about the restaurant, bakery and resort, log onto http://www.rhubarbrestaurant.ca/.